I am excited to be involved in this historical Field Trialing event! South Carolina will be host to it’s first Cocker Field Trial to be held at H. Cooper Black Trialing Area in Cheraw, SC. second series. The third series will be held on Saturday, January 23, 2016, if it is not completed on Friday. will start Sunday, January 24, 2016. Start time will be 8:00 am. each day. We are looking forward to starting a new trialing tradition in the south!!!! Trinket, owned by Ruth Heston and handled by Joe DeMarkis, took a 4th place on Friday, October 17th, at the Mid-Atlantic Hunting Spaniel Cocker Field Trial. This qualifies Trinket to enter the National Cocker Field Championship to be held in Altoona, PA , starting on Tuesday, October 28th. The trial will run through Saturday. Joe will also be handling our Reba, who is co-owned with Mary Lou Dunn. Let’s wish Team Joe D. the best of luck! Check back here for updates at the trial progresses this week! Cheryl and I had fun at the Mid-Atlantic Hunting Spaniel Club hunt test last Saturday. 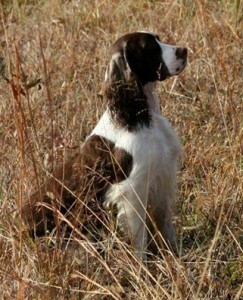 Retha, our English springer, was the last of 40+ dogs to run that day. 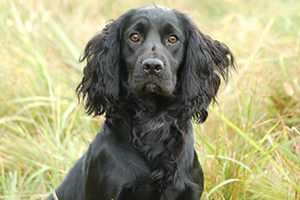 She scoured the field, gun to gun, amazingly and in record time produced her two pheasants. Unfortunately, she forgot to ask “Joe may I?” before taking a giant step on the second one! Uh oh, no master leg for her! We had a great time and thank those responsible for holding this fun event! Working with a Pro can save you an immense amount of time. If you decide to send your dog off to “Boot Camp”, be certain the trainer can do what you want him to do. Start off by meeting with the trainer and setting realistic goals. Once your trainer starts the process, do not be in a hurry to work with your dog. A good trainer goes through a bonding period before the dog will take the training. Follow –up lessons are the key! This way the trainer can keep an eye on you and your dogs’ progress. Starting your Pup properly is the key. Proper ground work should be instilled before introducing it to too much game. Once a dog shows you it likes to hunt, it is time to put in the controls. Be very cautious when introducing it to gunfire. One of the biggest problems I am paid to fix is gun nervousness. This is usually created by the owner. The dog does not understand that the sound of a gun is part of the hunt. Gun nervousness is something that can easily be avoided. Please go to the F.A.Q page on my web site. There you will find my gun proofing program. If it is a pup go to F.A.Q page on my web site. There you will find my starting program. If it is an adult dog, you must teach the dog to first recall, then hold, then recall and hold. Training an older dog to go hunting is not impossible. If your dog has a desire to hunt but you must use a conservative approach.